As always, the products are dedicated and fit to the season. 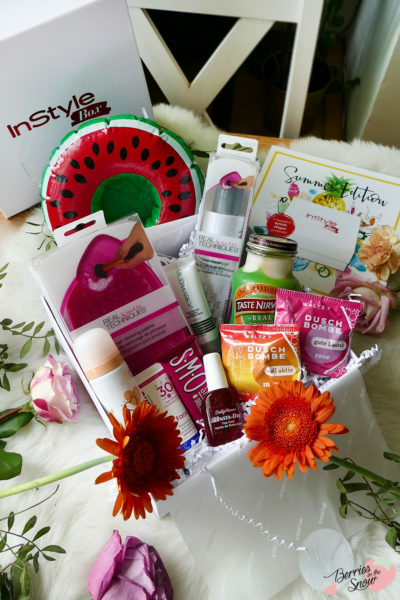 The topic revolves around hot days and vacation and the InStyle Box is filled with 10 different products and a sample, together with a booklet with descriptions and more discount coupons inside. 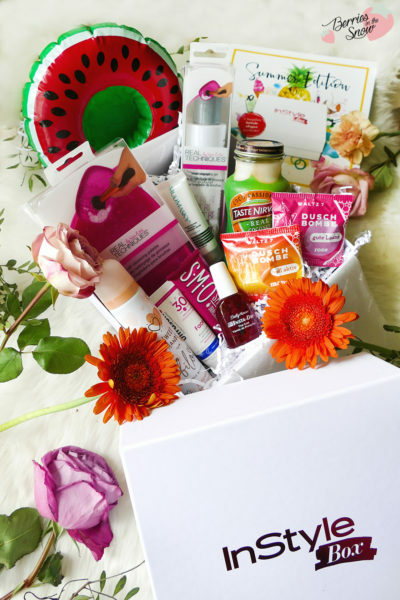 As you can tell from the pictures the box is really packed and heavy, and there are a lot of new products inside that wait to be discovered! 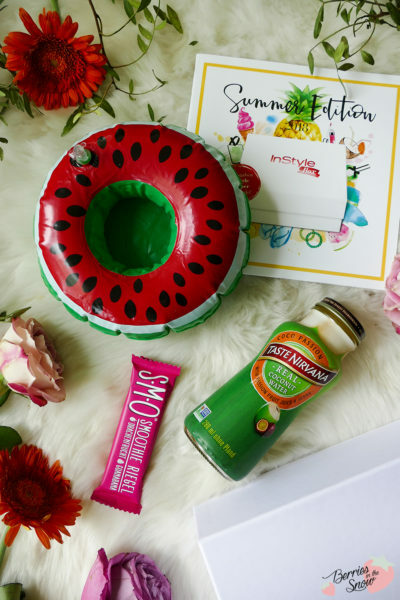 This coconut water is infused with passion fruit juice and seeds to deliver an exotic feeling. A great and healthy way to refresh yourself during hot days. I love these inflatable drink holders. They deliver a tropical vibe and can be used to let your drink swim in the pool. There is nothing more relaxing than a hot bath, but showers can be easier and some people prefer showering over bathing. These shower bombs are perfect for anybody who wants to have a relaxing spa Atmosphere while taking a shower. You simply put the shower bomb on the floor of your shower and the water will melt it away and release the relaxing scents. The two versions here are scented with mango and rose, respectively. 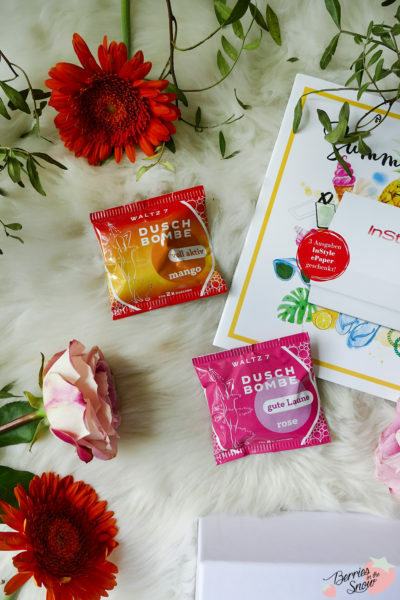 I tried these shower bombs in the past and love them so much! 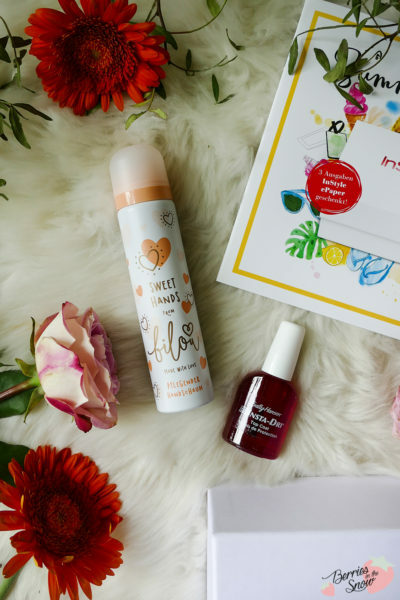 This hand care product comes as mousse-y foam out of the bottle. It contains vitamins E, almond oil, avocado oil and panthenol and has a sweet scent. I love this top coat! I’ve already used it so much since I received the box and it is so convenient to use and makes your nail polish dry down so much faster. 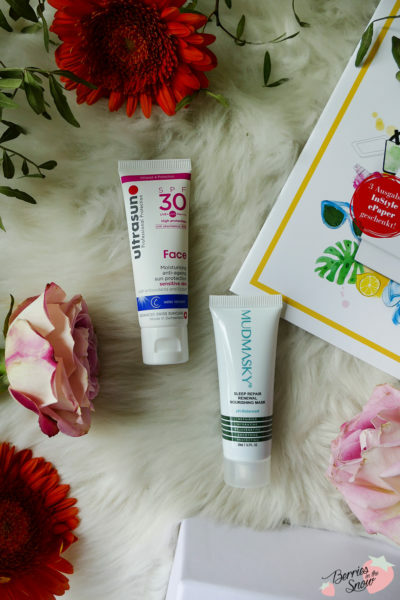 This water-resistant sunscreen doesn’t contain any harmful ingredients or hormone-active ingredients and protects your skin from sun damage while providing moisture to the skin. I used this sunscreen before and it feels nice and hydrating and doesn’t leave a white cast. It tends to leave a bit of a greasy feeling though while wearing it throughout the day. 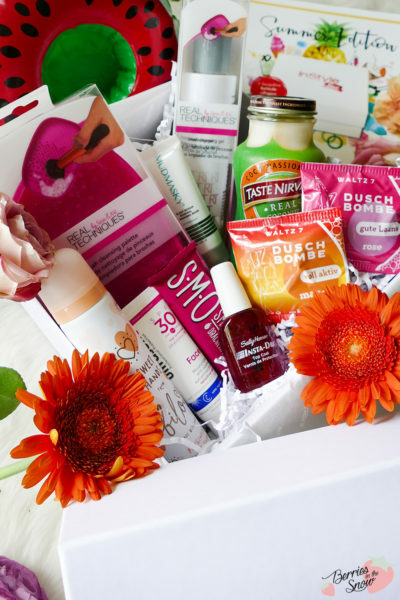 We should not forget to give our skin some spa-time for in-between, despite having so many things planned during summer. This pH balanced mask can be applied before bed-time and provides hydration, acts rejuvenating and repairing, and protects and smoothes the skin. I’m very excited about these two products! 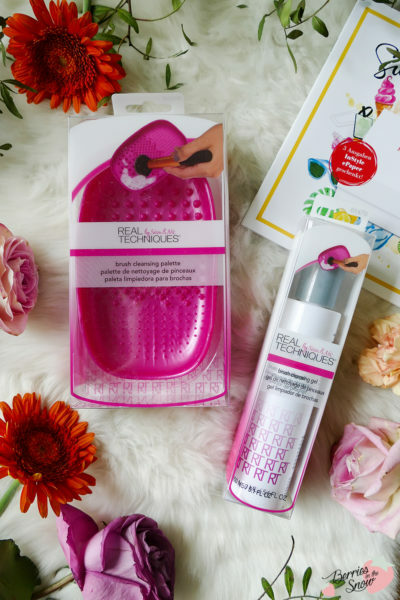 Cleansing your makeup tools is very important if you want to prevent breakouts and this kit seems perfect for cleansing your beloved makeup brushes. 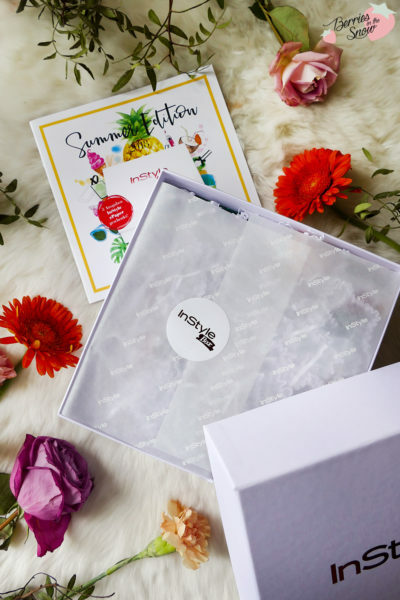 What do you think of the content of the InStyle Box Summer Edition? My favorite products are the Real Techniques Cleansing Set and the Shower Bombs from Waltz 7. ‘But I also love the Sally Hansen Insta-Dri Top Coat. I’m happy with this Box content again, and I must say it has a good value for its price. 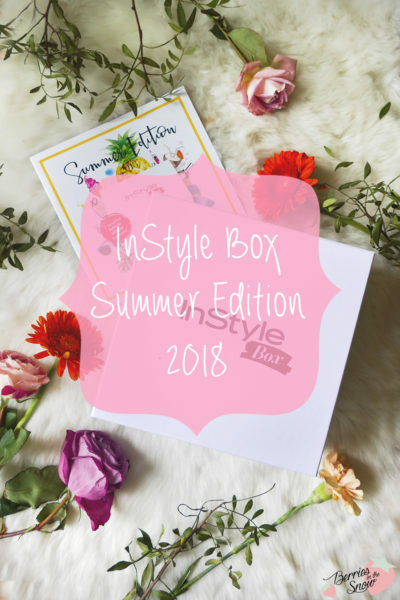 The InStyle Box Summer Edition 2018 is available on shop.instyle.de for 29.90€ and comes with 3 e-paper versions of the InStyle magazine. The InStyle Box is released every three months, for each season. You can also get it for a yearly subscription for 100€. Genau dieses Kokoswasser liebe ich!! Das schmeckt wirklich am besten. 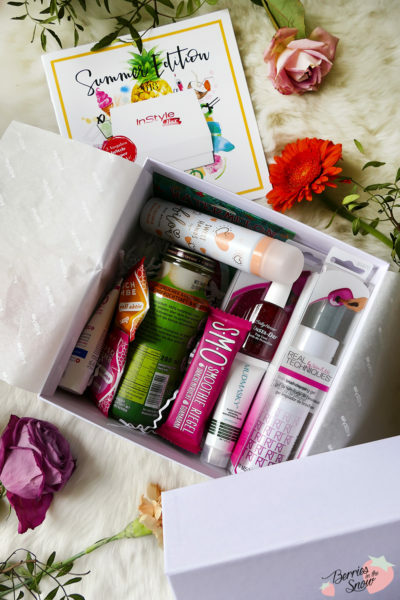 Finde die Box richtig klasse, eine tolle Zusammenstellung! Bis auf das Getränk sind ja wirklich schöne Produkte in der Box enthalten. Das Getränk hatte ich mal in einer Pink Box und finde es schmeckt überhaupt nicht. Ich bin ja kein großer Kokoswasser fan aber das mochte ich sogar ausnahmsweise. Deswegen fand ich es gar nicht so schlimm. Der Rest der Box ist auch echt schön gestaltet.